Your first serve is critical and one of your most important weapons in your tennis game. Hitting your first serve with pace, spin and placement gets you into your rhythm and ahead at the start of the point. Missing that first serve consistently can hurt confidence and give your opponent the upper hand in the point. Many tennis players perform well in practice, but something seems to happen in matches that prevents them from performing optimally. By missing your first serve, you are at a huge disadvantage and will lose so many service games. What is the cause of the mental obstacle of consistently missing your first serve? The most common reason for consistently missing your first serve is worry. Worrying about your serve causes you to second-guess your ability and technique, as well as heightening the sense of pressure you experience. When you lack trust in your serve, you begin to consciously think about your technique as you serve. You are successful in a practice set because you don’t consciously pay attention to your toss, mechanics, timing, and placement of your serve. Conscious thought interferes with a smooth serving stroke (racket head speed slows down, the amount of spin is lessened and your power output is reduced). After several serves into the net or long, many tennis players will over compensate by altering their swing over-analyzing the problem. 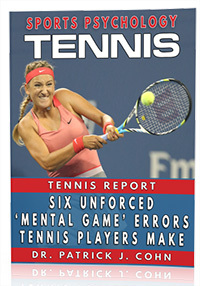 This is typical of how the mental aspects of tennis can affect your physical performance. How do you overcome the mental obstacle of faulting on your first serve? If you can consistently serve well in practice, then technique is probably not your issue. So how can you transfer your consistency in practice to match play? 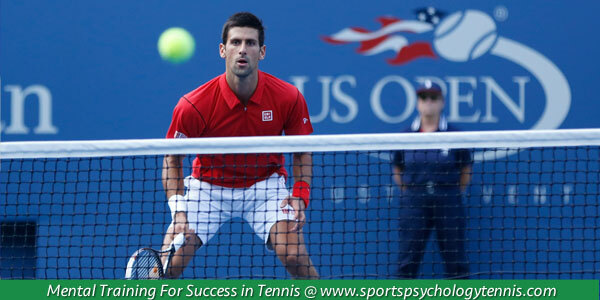 You need to replicate your practice mentality during tennis matches. Your physical approach and mental approach need to be identical in practice and in matches. In practice, you are not worrying about serving a fault. You are just focused on your strategy for the point. If you are fearful of missing your serve in matches, you are focused on the thing you don’t want to happen instead of hitting a good ball. Stay focused on what you want to do with your serve, see the ball land where you want it to and then execute it. Know that you will miss some serves but maintain your physical and mental approach. If you miss, move on and focus on the next point. Tip #1: Think about the differences in your mental approach to serving in practice and matches. What thoughts seem to get in your way in matches? What do you think about when serving in practice? Tip #2: Create a mental and physical routine that you can perform in matches prior to every serve. Your mental routine can include taking several breaths, shrugging your shoulders to relieve some tension, planning your serve, and trusting your stroke. 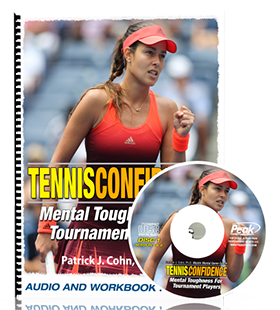 Take control of your mental game and your physical game will improve dramatically.